Many people in the world have their basic physical needs (food, clothing, and shelter) met. Yet, when these necessities are satisfied, what’s the next level? We crave acceptance. I have been active on social media for about eight months now. My narrow view of the world has expanded to the point where some of my former attitudes seem incomprehensible. Compared to my previous world vision, my current vision could be described as x-ray. I am not the critical person who believed there was only one right way to act, think, or speak. Aside from that, I still operate under a traditional value system. Two of my most well-received blog posts have related to the importance of being accepted and nurtured by other people and God. 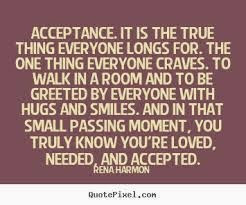 It’s obvious acceptance is a subject close to our hearts. We don’t all worship, dress, read and write, or accomplish jobs at the same level. Yet, nobody wants to feel marginalized because they don’t have the knowledge, physical or mental capability, interest, or resources needed to live up to someone else’s expectations. 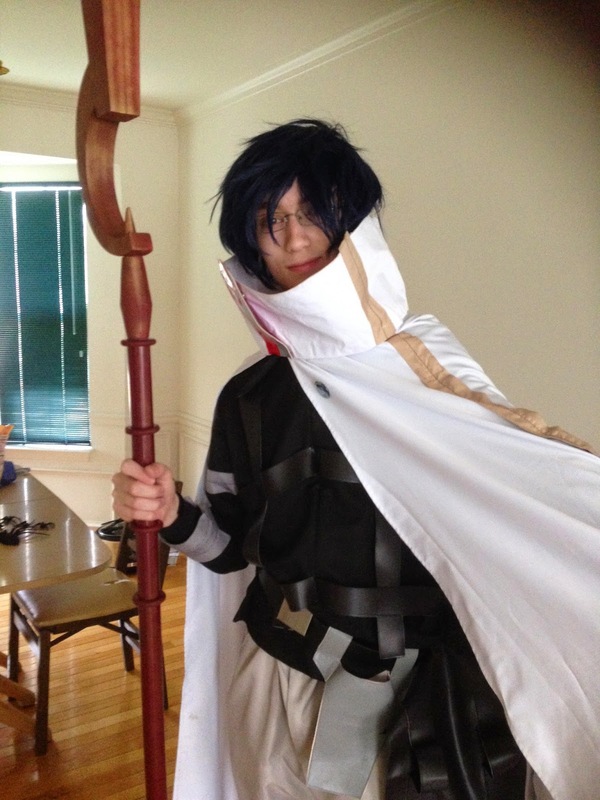 This is my son, J. D., dressed up as the anime character, Shiroe. He enjoys anime music, videos, and conventions. We have had deep discussions about the characters, messages, and animation of various movies and series. Still, I am not nearly as involved in the genre as he is. Here is my daughter, Caitlin, dressed up for “Wacky Tacky Day” at her high school. In the same manner as her brother, she appreciates anything anime. However, as you can see by the picture, she values silliness even more. She loves to laugh at herself and others. Although I crave laughter, too, I am more reserved than my daughter. well educated or a high-school dropout. Gideon was young. David was a shepherd boy. Elijah was depressed. Ruth was a foreigner. Yet, God used all of them. Even today, what we all have in common is a desire for acceptance. People who are supportive are likely to be supported in return. It’s a give and take situation. 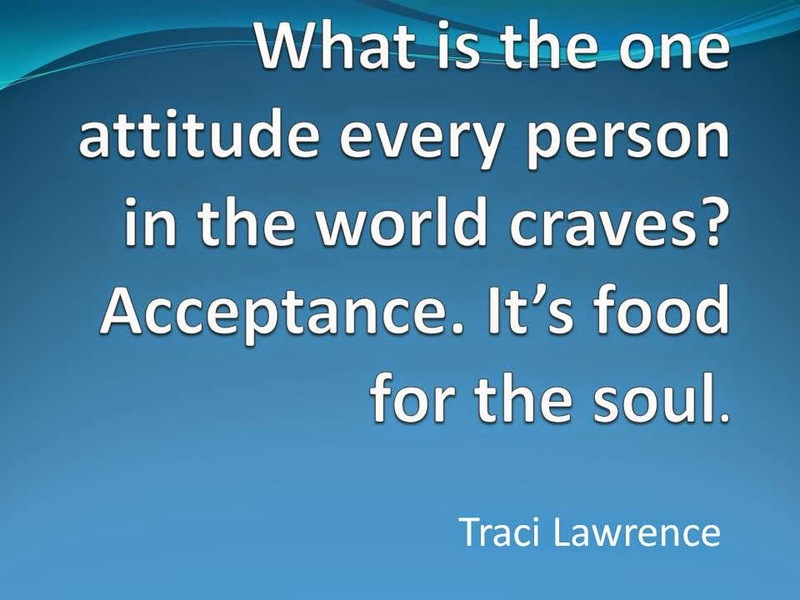 Who are you going to accept today? Hi, Sandra. Thanks so much for your comments! I hear you about wanting acceptance from people whose opinion means the most. Unfortunately, not even loved ones are always willing/able to give us support. Like you said, we're accepted by God; that's what counts. Hi, Heys! I appreciate your comments! We do want our accomplishments to be acknowledged, even if they might not seem be as earth-shaking as someone else's triumphs. It's not about competition and comparison; it's about each person doing his/her best. I was judgemental earlier this decade about everything and everybody! and then, I joined Art of Living, a yoga training session run by Shri Ravishankar and I was taught to accept people as they are! Initially it was really a challenge to accept people as they are, but now i am used to it. Lovely post Traci. Hi, Ajay! Thanks for your insightful comments! 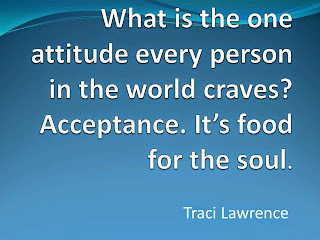 Many of us need to learn to be more accepting; however, it's a difficult lesson to learn. The natural inclination is to favor only those who are like us.